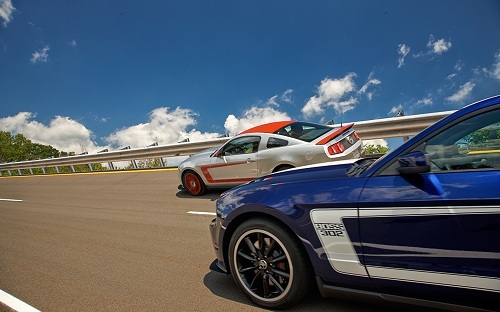 Robb Report awards the 2012 Ford Mustang Boss 302 Laguna Seca the Best of the Best Coupe honors. The 2012 Ford Mustang Boss 302 Laguna Seca carries forth a tradition of great Mustangs about a half century long. For almost a quarter century the Robb Report has listed the finest things in life. Catering to the affluent, the Robb Report does not consider the price tag to be a factor in its determination of what is best. What this publication is seeking is simply the best. In 2011 the Robb Report awarded the Aston Martin V12 Vantage its Best of the Best in the Coupes and GTs category. A worthy winner. At nearly $200K it should be among the best. This year the Best of the Best Coupe / GT is the 2012 Ford Mustang Boss 302 Laguna Seca. That a car made in America, by a brand not bailed out by the taxpayers, and costing under $50,000 can beat out the best in the world is outlandish, right? Not really. As soon as the current generation Mustang GT became available a few years ago comparisons to the BMW M3 and other near-exotic cars began to take form. For those not able to tell a base 2012 Mustang GT from a Shelby GT500, here is what the Boss is all about – Handling. The engine in the Boss does have a little bit more push than the standard Mustang GT 5.0 (5.0 liters of displacement= 302 Cubic Inches, or pretty much does). There are Mustangs that have more power. It also has that growl you want in a good V8 from Ford. But that too is pretty much standard on all the Mustangs from GT up. The Boss is about the bits that make it faster around a twisty race track. The suspension is optimized for race handling and includes adjustable shocks that can be tuned for a specific race track. Leguna Seca is of course a race track. This Ford Mustang is named for it and many of the parts this version comes with make it even more special. In case the driver forgets the layout of Laguna Seca, he can jump out, run around the back and look at the logo stamped on his rear deck. Up front there is a splitter that looks like it was made in your basement by a kid with an erector set and some stolen carbon fiber. It looks funny, but it holds the nose down above 100mph quite nicely allowing the front tires to stay planted and prevent under-steer. It is so extreme that in its press release Ford says it may degrade crash-worthiness and they won’t even put it on for you. They want you to install it for fear of being sued. Behind the driver’s custom Recaro racing style seats, the rear seats are gone replaced with braces that add stiffness to the chassis to reduce twist when the car is turned in hard. Brembo brakes are employed and they improve stopping so that the brakes don’t fade on the way down from triple digits approaching a corner. It is this type of hardware that the Boss 302 is about. In its article the Robb Report highlights that the car comes with three pedals and a six speed manual transmissions. Some things just don’t need to be improved upon.